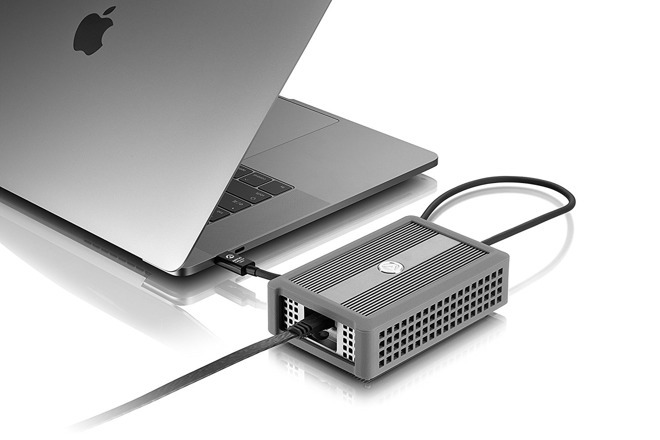 Enclosure manufacturer Akitio has started to ship the Thunder3 10G Network Adapter, an accessory for an iMac or MacBook Pro offering connectivity to an ethernet network at speeds of up to 10 gigabits per second, all passing through a Mac's Thunderbolt 3 port. The Thunder3 10G Network Adapter is meant to extend the networking capabilities of a Thunderbolt 3-equipped device to allow them to connect to higher-speed networks used in business and enterprise operations. 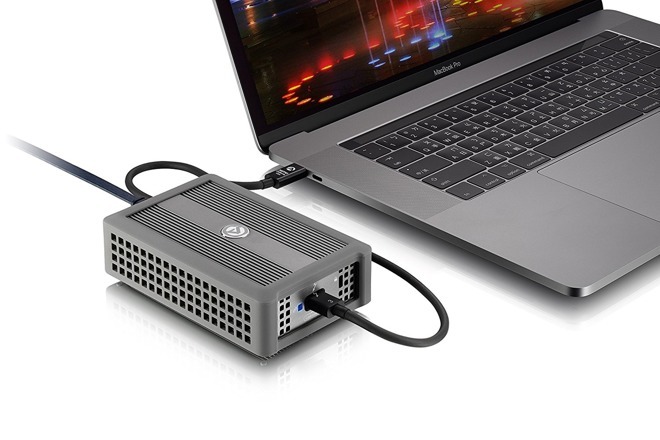 In the case of this adapter, it takes advantage of the high 40-gigabits per second bandwidth available in Thunderbolt 3 to make the network connection. As the iMac Pro launched with 10 gigabit ethernet, the adapter could be useful for owners of the MacBook Pro or iMac who want to connect at the same network speeds as Apple's newest desktop Mac, but without fully upgrading. For the iMac, this effectively adds a second 10 gigabit-capable adapter alongside the existing gigabit ethernet port, while also providing a way to connect to a physical network to modern MacBook Pro models that have only Thunderbolt 3 ports for connectivity. Akitio's device will work with standard 10 gigabit per second networks, including support for 9K jumbo frame support, though it is also able to automatically switch to support slower connection types. This includes the 100 megabit and gigabit networks typically found at home, as well as networks supporting transfers at 5 gigabit and 2.5 gigabit per second speeds. Measuring 4.96 inches by 3.15 inches and 1.5 inches thick, the Thunder3 10G Network Adapter is a compact unit that can be easily transported. Encased in aluminum, said to be used to optimize heat dissipation caused through its fanless design, it is also supplied with a protective rubber sleeve to keep it safe from knocks while being carried around. The use of bus power is useful in terms of portability, as by drawing power from the connected Mac, it doesn't require a separate power connection. Its design also makes it relatively simple to set up, with the ethernet port on one end of the casing while the Thunderbolt 3 port, LED power and link status indicator, and Kensington security slot reside on the other. The Akitio Thunder3 10G Network Adapter is available to purchase for $279.99 from Amazon. It is compatible with all Thunderbolt 3-equipped Macs running macOS 10.12.5 or later, and requires a driver to be installed before use.